We’d love your help. Let us know what’s wrong with this preview of Wine and War by Don Kladstrup. The remarkable untold story of France's courageous, clever vinters who protected and rescued the country's most treasured commodity from German plunder during World War II. In 1940, France fell to the Nazis and almost immediately the German army began a camp The remarkable untold story of France's courageous, clever vinters who protected and rescued the country's most treasured commodity from German plunder during World War II. To ask other readers questions about Wine and War, please sign up. A poorly organized tribute to French winemakers who risked their lives to save their bottled wine and beloved crops during World War II. The concept of this book is original and interesting, and is what initially got me reading it. It tells the story of various French winemakers and associated individuals as they struggled with German occupation through WWII. It's short (250 pages), easy to read, and generally interesting to anyone who enjoys wine, French culture, or wants to read an interesting take on WWII history. While generally entertaining and somewhat engrossing, the biggest issue I had was the choppy storytelling. The auth The concept of this book is original and interesting, and is what initially got me reading it. It tells the story of various French winemakers and associated individuals as they struggled with German occupation through WWII. It's short (250 pages), easy to read, and generally interesting to anyone who enjoys wine, French culture, or wants to read an interesting take on WWII history. While generally entertaining and somewhat engrossing, the biggest issue I had was the choppy storytelling. The authors clearly were able to collect a large amount of information from the individuals they spoke to, but aren't able to weave it cleanly together. The shifts between similar experiences of completely separate people were frequently abrupt and sometimes confusing. The individuals whose stories were told would pop up from time to time, but it was never very easy to remember who they were and what their earlier story was. The last third or so of the book progresses much more cleanly, and the story of the French POWs throwing a wine bash, the French finding the wine in Hitler's bunker, and the trial of one of the biggest wine merchants of the time flow much more neatly and are good reads. When I first read reviews of this, there was an awful lot of gushing about how magnificent it was that the French had doggedly withheld much of their best wines from the Germans during the occupation, often by hiding it in cellars and secret rooms, and as much as I like wine, I couldn't help but note that perhaps people who had the wherewithal to hide stuff from the Germans might have focused their energies on hiding other things as well. My interest was caught enough, though, that I picked this When I first read reviews of this, there was an awful lot of gushing about how magnificent it was that the French had doggedly withheld much of their best wines from the Germans during the occupation, often by hiding it in cellars and secret rooms, and as much as I like wine, I couldn't help but note that perhaps people who had the wherewithal to hide stuff from the Germans might have focused their energies on hiding other things as well. My interest was caught enough, though, that I picked this up when I had the chance. I realized even at the time that I was being a bit unfair and snarky, and now I think the reviews were a bit unfair to this book by focusing so much on the wine. This is a collection of personal stories about the French wine makers and their experiences during Vichy, and many of them are simply remarkable, such as Jean Huet's (Clos du Bourg) time as a POW, Bernard de Nonancourt (Laurent-Perrier) joining the Resistance, and the Miailhe family (Pichon-Lalande) indeed harboring Jewish families in a hidden annex. And for wine-lovers, there are still plenty of anecdotes about French wine culture. It's a very patriotic book, from reading it one would get the impression that every man, woman and child in France was actively and cheerfully involved in sabotaging the Reich -- it's a little light on the complexity and ambiguity of the occupied France. Recommended: This is really a tribute book, it's not too heavy on the social analysis, but even so, it's a frisky read. People who like wine, have visited French wine country, or are interested in WWII or French history would most likely enjoy this as light, inspirational reading. You'll certainly be inspired to seek out some good wine. It's hard to understand how important the wine is to the French; perhaps the best analogy would be how important sport is to us Americans. With too few male sluggers to form a baseball league while liberating the French, we pinch-hit the ladies. This book covers how the winemakers of France covered their cherished fields during far greater deprivations. The challenge for amateur historians and husband and wife team Don and Petie Kladstrup is how to balance the routine horror of Vichy France, with It's hard to understand how important the wine is to the French; perhaps the best analogy would be how important sport is to us Americans. With too few male sluggers to form a baseball league while liberating the French, we pinch-hit the ladies. This book covers how the winemakers of France covered their cherished fields during far greater deprivations. The challenge for amateur historians and husband and wife team Don and Petie Kladstrup is how to balance the routine horror of Vichy France, with its deportations; shallow graves; shattered families; and, inevitably, its defaced chateaus and incinerated vineyards; with what is essentially details and trivia of a national pastime. While they do a good job culling from their interviews, much of text is clearly secondary source, their emotional tone often off cue, and the language flat even describing the wine itself. Still, just as poetry became indispensable to resistance Poles, the French drew more than mere moral support from some of their most powerful luxury-goods producers. Wine caves became great places to hide guns and fugitives. Allies could drop supplies into vast vine fields. And best of all, Nazis could be softened, and even somewhat civilized, by the prestige of great wine and the distinction of being able to say one recognizes and appreciates it. A diverting, anecdote-rich account of wine protecting and selling (and swilling, and squirreling away, and replacing cleverly with plonk) during the Second World War. Three+ stars. If you don't like wine -- especially French wine -- you will not enjoy this book. This is far more about French wine than anything else. (And how the French make the best wine.) I like French wine and champagne and enjoy reading WW2-era books, so I did enjoy this book. Reading this book was much like drinking a nice glass of wine, there is a lot that I enjoyed and there's a lot that I didn't understand, wine names and place names but nothing that interfered with the pleasure of the book. every adult should be aware of. Unfortunately it has always escaped me, but a friend of mine at my bookclub is one and I can see that kind of enjoyment it gives him. By a kind of weird twist of fate of whoever watches over t Reading this book was much like drinking a nice glass of wine, there is a lot that I enjoyed and there's a lot that I didn't understand, wine names and place names but nothing that interfered with the pleasure of the book. By a kind of weird twist of fate of whoever watches over these things, Bacchus I guess, or is it Jim Backus, I started to become a bit of a whiskey geek. This is also due to my book club where, after the main body of the meeting our host pulled out some whisky. I've been hooked ever since. I have to say I enjoyed this book much more then the whiskey book I read over the summer, and felt that a lot of the sensibility of wine drinkers can easily translate to whiskey drinkers. Maybe it was the combination of the personal stories along with the very deep French love of wine that touched me in this book. I can't think of anything in my adopted country of Japan or even in my home country of America that equates with the French feeling for their wine. Maybe guns in America? I posted a quote from this book and an old college friend, a self-confessed wine geek said he has thoroughly enjoyed this book. 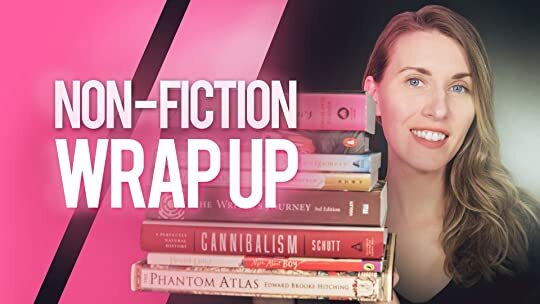 We have probably read 700-800 books over the past decade, maybe seven or eight of which have been non-fiction! But knowing we were wine aficionados, a friend lent us this historical account of how the French vintners struggled to save their wineries, their precious wine cellars, and of course, even their lives for that matter during the German occupation of France during WWII. The book reflects extensive research, and much of the anecdotal narrative recounts stories garnered by the authors direc We have probably read 700-800 books over the past decade, maybe seven or eight of which have been non-fiction! But knowing we were wine aficionados, a friend lent us this historical account of how the French vintners struggled to save their wineries, their precious wine cellars, and of course, even their lives for that matter during the German occupation of France during WWII. The book reflects extensive research, and much of the anecdotal narrative recounts stories garnered by the authors direct from the principals or their families. While most of the town and winery names were hard to keep straight, the charming tales were fun to read, educational, and reflective of the courage of the people who barely survived this horrible time. The Nazis of course had no compulsions about stealing literally millions of bottles of wine and champagne, and would plow through the vineyards with their tanks or whatever with abandon. One of the most clever tactics of many of the wineries was to construct permanent walls or seal off caves containing their most precious stock, including bottles already decades in repose. An extensive glossary, notes section, bibliography, and index might well serve the serious reader. For us, the book did a fine job of illuminating the partial survival of undoubtedly France’s most valuable resource, in an entertaining style despite the horrors of the time in history under consideration. Just when you thought all the WWII books had been written - along comes a new angle. I thought this was a fascinating look at the futility of the Hitler regime - exemplified by the systematic looting of French wine to stockpile his Eagle's Nest..despite the fact that Hitler did not even like wine. Or the 3 year effort to tunnel up a mountain for an elevator shaft to carry the wine to the Eagle's nest - later rendered useless by retreating Nazis. The Nazis come off as a group of boorish thugs in Just when you thought all the WWII books had been written - along comes a new angle. I thought this was a fascinating look at the futility of the Hitler regime - exemplified by the systematic looting of French wine to stockpile his Eagle's Nest..despite the fact that Hitler did not even like wine. Or the 3 year effort to tunnel up a mountain for an elevator shaft to carry the wine to the Eagle's nest - later rendered useless by retreating Nazis. The Nazis come off as a group of boorish thugs in this book, which is no doubt pretty accurate. (Of course, most accounts of the French Revolution or the persecution of the Huguenots portray the mass of French people as a group of bloodthirsty thugs, so you could argue that thuggishness all depends on your point of view). At any rate, interesting to read of the wily stratagems the French used to foil the Nazis. More complicated is the issue of collaborators - the French who appeared to cooperate with the Nazis in order to keep their wine businesses running. After the war the alleged collaborators went to great lengths to justify and launder their activities - some with more success than others. Like most wars - this one was a tragedy and I was left with the sense of what a huge black waste the Nazis made. This book is a fairly standard World War II home-front narrative, focused on the view from wine-producing regions of France. As can be expected from a wine-focused narrative, it had just enough hints of enophile nonsense in its boquet (see what I did there?) to put me off quite a bit, but there were some redeeming anecdotes in it. It did somewhat remind me of a better book, A Foreign Fiekd by Ben Macintyre, which is the story of stranded Americans hiding from the Germans during World War I. It This book is a fairly standard World War II home-front narrative, focused on the view from wine-producing regions of France. As can be expected from a wine-focused narrative, it had just enough hints of enophile nonsense in its boquet (see what I did there?) to put me off quite a bit, but there were some redeeming anecdotes in it. This nonfiction book tells how French winemakers protected their wine and vines from the Nazis during WWII. It took me a few chapters to get into the story because it was difficult for me to keep all the French names straight, and I was too focused on understanding what part of France was being described. Once I let all that go and read it only for the stories, it became interesting (and eventually it was very easy to keep who, where and when straight). 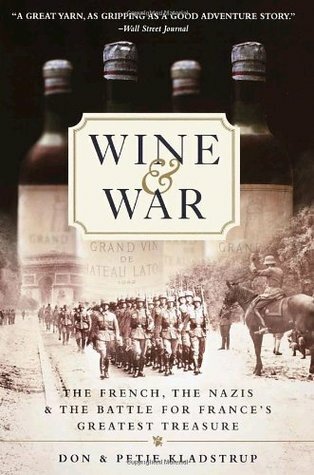 This is an interesting part of the history This nonfiction book tells how French winemakers protected their wine and vines from the Nazis during WWII. It took me a few chapters to get into the story because it was difficult for me to keep all the French names straight, and I was too focused on understanding what part of France was being described. Once I let all that go and read it only for the stories, it became interesting (and eventually it was very easy to keep who, where and when straight). This is an interesting part of the history of WWII. I understand a little bit more about the French, and definitely want to read more about France during WWII. An interesting look at the French wine industry during WWII. Provides some insight into how people cope with an occupation, what it means to resist and collaborate and the attitudes of an occupier when the combatants are neighbors. However, it is a bit light on history when the authors drift from the main topic, making some rather odd assertions (like the impact of mistresses on foreign and defense policy) with no analysis. I would guess this is more a defect of the type of history this is: easi An interesting look at the French wine industry during WWII. Provides some insight into how people cope with an occupation, what it means to resist and collaborate and the attitudes of an occupier when the combatants are neighbors. Lively, engaging story of French winemakers' efforts to protect their legacy and livelihood from greedy Nazi invaders, though probably of more interest to oenophiles than others. Ironically, my favorite wine is a nice dry Riesling from Germany. This was an interesting enough book but it really never had me where I couldn't put it down. Since the story never really pulled me in I felt lost sometimes among the many people discussed in the book. This book had some very interesting stories in it. Unfortunately, the author jumps around a lot, especially back and forth through time. I got so frustrated with the jumping that I put it down twice and I don't know that I have the patience to finish the book. I'm not much for nonfiction, but this goes down easily. Informative, by turns light-hearted and moving (that ending line, though! ), and may have inspired me to drink a bit more than I ought this week. Vive la France! Voilà un document intéressant, mais malheureusement un peu superficiel, dans la mesure où l'on a plus affaire à une suite d'anecdotes classées chronologiquement qu'à un véritable travail historique sur le vin en France pendant la Seconde guerre mondiale. Néanmoins il est intéressant d'apprendre que l'armée allemande avait nommé dans chaque région viticole française des Weinfurer chargés de contrôler la production des vignobles français et de piller méthodiquement leurs caves. A good view into French society and the vital role winemaking and individual families played throughout the country during the German occupation. I learned a lot about France during WWII-- its resistance, patriotism and collaboration. An education (for me) about the widespread importance of the wine trade in France from its earliest history to modern time. This book surprised me with how interesting it was. I was not particularly interested in wine but found that the subject was absolutely riveting. it revealed how hard the French had had to fight to save their wine industry from destruction by the Nazis. The lengths they went to and the difficulties they faced revealed aspects of the war that I had never event thought about such as the Germans taking not only their young men but their horses and trainloads of wine. Some families had had to change This book surprised me with how interesting it was. I was not particularly interested in wine but found that the subject was absolutely riveting. it revealed how hard the French had had to fight to save their wine industry from destruction by the Nazis. The lengths they went to and the difficulties they faced revealed aspects of the war that I had never event thought about such as the Germans taking not only their young men but their horses and trainloads of wine. Some families had had to change nationality when the Germans occupied the Alsace area for example. Certainly an insightful story and different perspective on a World War II story. It would be best for someone who knows their wine - I found some of the jumping around confusing as I didn't know these names and houses. This was on a long list of Rick Steves book recommendations for French culture and history. Several of the stories were touching, and it will inspire you to pop open a Merlot. However, the book lacked consistency. You read about celebrations over half a glass of wine in a German prisoner camp. Then slog through courtroom accounts of whether a particular winemaker conspired with the Germans. It was difficult to tell where one story picked up and another began. I listened to the Audible version but This was on a long list of Rick Steves book recommendations for French culture and history. Several of the stories were touching, and it will inspire you to pop open a Merlot. I listened to the Audible version but can't recommend it. The poor quality outweighed the multiethnic voice acting. I received this book from my grandfather (?) a decade ago. I wish I had read it when he was still alive so I could talk to him about the events in this book. Like me, he was a Francophile and we shared stories of the different trips we took around France. He fought in WWII, but never spoke about his time code-breaking. I wonder if discuss Review originally posted at Bettering Me Up. I received this book from my grandfather (?) a decade ago. I wish I had read it when he was still alive so I could talk to him about the events in this book. Like me, he was a Francophile and we shared stories of the different trips we took around France. He fought in WWII, but never spoke about his time code-breaking. I wonder if discussing this book could have opened that door. This was an interesting look at the economics of wine during Hitler's reign and the Occupation of France. The histories of the different vineyards, the details of the wines, and the stories of the owners--some who were left to run the vineyards and others who were in hiding or sent to concentration camps--make this book come alive. 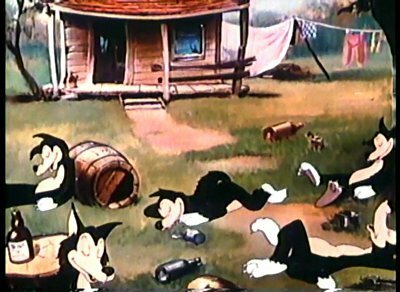 The grapes had an "exhilarating effect" on the wolves. "I suspect the stomach of the wolf is so constructed that the fermentation of the fruit juices proceeds rapidly after the animal has eaten the grapes. At any rate, intoxication is frequently the result." Monsieur Le Brun says he recalls seeing a drunken pack running by his home. "...the wolves were all intoxicated. That was what caused them to run into the town in the first place, and it was also what saved the townsfolk after they had come in. They were too drunk to remember that they were wolves...they just lay down in the street, stupidly drunk." Perhaps because the French capitulated so early in World War II, there seems to not have been that many prominent books about WWII France. At least I have not come across them. The ones I have seen center on German activities/strategies/atrocities or D-Day or come from the British/American perspective. This book was incredibly enlightening (for me) as to what went on in France during the Occupation. The writers did an excellent job of tracking down key players in the wine trade and learning their Perhaps because the French capitulated so early in World War II, there seems to not have been that many prominent books about WWII France. At least I have not come across them. The ones I have seen center on German activities/strategies/atrocities or D-Day or come from the British/American perspective. This book was incredibly enlightening (for me) as to what went on in France during the Occupation. The writers did an excellent job of tracking down key players in the wine trade and learning their stories. Some were amusing or showed the individual's cleverness and courage, but the writers did not shy away from telling the stories that did not turn out as well. I liked that this book was told on a human, micro level. Too many books on this war can lean on macro-type story telling - focusing too much on overarching themes and strategies. I also liked learning about the sometimes close ties between wine makers and the Resistance. I think a bit better editing and this little gem would be 5 stars. The story of the struggle between the French people through the vignerons and Nazis and their incredible thirst for all things French (while at the same time seeking to destroy that culture) lends another dimension to the war story as well as the people story of WW2. There were certainly enough bad guys on the German side (most you can name without the book) but a few unlikely German heroes pop up too. And there are the French bo I think a bit better editing and this little gem would be 5 stars. The story of the struggle between the French people through the vignerons and Nazis and their incredible thirst for all things French (while at the same time seeking to destroy that culture) lends another dimension to the war story as well as the people story of WW2. There were certainly enough bad guys on the German side (most you can name without the book) but a few unlikely German heroes pop up too. And there are the French both free and Vichy that fill in the rest. One thing the book will give you is another dimension to what Vichy meant to France and why it ultimately failed so terribly. I have a disappointing tendency to read books (or see movies) and eventually forget everything about them - even if I actually liked the book or movie. This is what happened with Wine and War, so I just re-read it. It's good! Very approachable; you don't need to know much about WWII to follow along, and wine terminology is explained in context. At times it reads like a high school history paper, and at other times, I think, "This would make a great movie!" There's a cast of recurring characters t I have a disappointing tendency to read books (or see movies) and eventually forget everything about them - even if I actually liked the book or movie. This is what happened with Wine and War, so I just re-read it.